Hey folks, TGIF right? I’m so looking forward to the weekend and nice break from the working week. I’m planning to feature cats of the world and their loving owners every fortnight, answering some simple questions and providing some photos. Any kind of cat, any background, any age. If you want to get involved, drop me a message on my Contact page or on social media and I’ll be in touch with the questions to answer. You maybe have noticed, that I’ve also updated my Facebook logo. I’ve been meaning to sort one out for a while, and last night I had a spare half hour and set to it. As it’s Friday, there is just one last thing to do… the Friendly Fill-Ins from 15andmeowing and four-legged furballs blog hop. 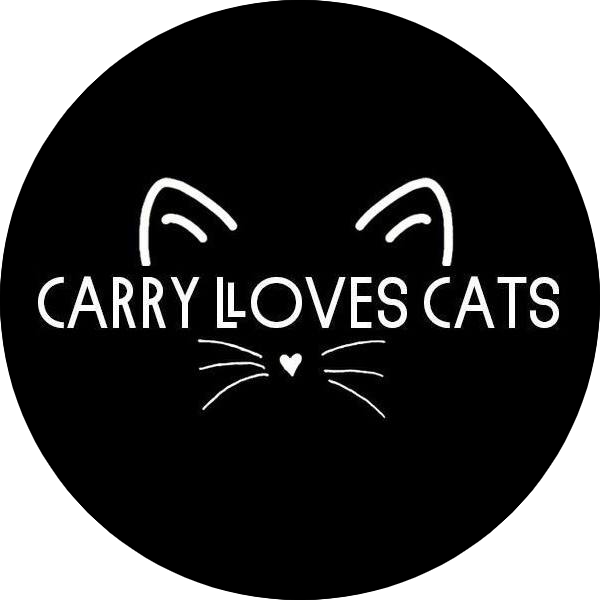 Carry: One can be lonely without her pet cats. Laser: One can eat all of the tuna by herself if you let her. McLaren: One can of tuna please. 2. Given the choice of _________ or _________, I would pick _________. Carry: Given the choice of a night in or a night out, I would pick a night in everytime. Laser: Given the choice of McLaren or another cat, I would pick McLaren. He’s annoying at times, but he’s my baby brother and I love him. McLaren: Given the choice of wet food or dry food, I would pick both please. 3. _________ makes me feel _________. Carry: Confrontation makes me feel uncomfortable, so I tried to avoid posting about controversial topics that might cause people to try and argue with me. Laser: Carry’s warmth in bed makes me feel cosy and safe. McLaren: Food makes me feel happy. 4. I never go a day without _________. Carry: I never go a day without fussing my furbabies. Laser: I never go a day without making sure my coat is soft and groomed. McLaren: I never go a day without food! We enjoyed those answers and we don’t do controversial either, there’s plenty of that in the world. Hey, we saw your new logo on Facebook, it’s super nice, we like it. Cool logo! How can one NOT fuss over their furrbabies? I bid each one good-bye when I leave the house, and greet them again when home. I look for them constantly, counting cat noses. The Hubby gets his nose out of joint when I ask HIM if he’s seen Manny or CB, but I’ve discovered a cat closed in a closet or bathroom more than once! I’m the same. They both run to to the door to greet me when I come home, so that’s really cute and McLaren grabbies at my hands until he’s satisfactorily fussed. When I leave i shout bye to them both. In a morning they’re normally still eating their breakfasts though, so they tend ot be upstairs. I’m not sure if they hear me. My favourite thing is when I pull up on the drive and they’re both watching out the window. As I put the handbrake on the both run off to the door to wait! I love you, McLaren! Your answers are always right up my alley. I like being an only cat but wonder if you get to eat some of Laser’s food too. Oh yes, McLaren often eats Lasers food. He eats a lot faster than her and quite often nudges her out of the way to finish off what she has left. Laser has also learned that if I spot McLaren doing that, she gets a treat to ‘top her up’ from the missed food, so I’ve caught her a few times pretending to eat and then when McLaren starts on her food she comes running to me for a treat! So cheeky! I love your new logo and I’m following you on Facebook as of this morning. I love your fill-ins. I like that you all answer them. Cute. Thanks for following. Do you have a FB page for your blog? I have searched in the past to tag you in posts where I join blog hops, but I’ve not found anything that I suspected was you! I think McLaren and Laser’s answers are much better than mine! Thank you to all 3 of you for these great fill-in answers. McLaren, you have a one track mind with the food, much like myself 🙂 I hope you get some tuna and treats. And I agree with Carry, one is never alone when you live with cats. Have a wonderful weekend! He really does have a one track mind. Food, fuss that might turn into food if he’s lucky, and sleep because there is no food – that’s his little life, bless him! Your facebook badge is very eye catching and that’s what you want. I think an interview of cats around the world would be very interesting. McClaren sounds just like Budd. All he seems to think of is food and when he finishes his food he smartly heads over to the girl’s food. I just can’t seem to get him settled on the idea that 2 cans of Fancy Feast a day is enough. Thank you all for joining in on the Friendly Fill-Ins! The progression of your three answers for #1 had me laughing! And I completely agree on opting for a night in. I’m one of those who wants nothing more than to go home after work on a Friday, get in my pajamas, and spend the night snuggling with my furbabies on the couch. Wishing you all a cozy weekend! Poor Mac, always thinking about his tummy! Ummm…McLaren, do you like food? MOL! Great fill-ins, everyone. Love the logo, so now I’m off to find you on Facebook! McLaren thinks of nothing but his belly 🙂 Haha. Even when he’s asleep I’m sure he’s dreaming of the food he will have when he wakes up! Laser, I soooo agree with you about the coat grooming thing. I don’t think people realize how hard we felines have to work to be as gorgeous as we are! I am constantly working on my shiny white fur. People always comment on how soft and lovely my fur is. I take great pride. Have a blessed Sunday and week, all of you! Oh boy, yes. Food makes the world go round! It can be difficult to find something someone won’t find a problem with. There are going to be haters. Hang in there and don’t let those turkeys keep you from flying high. Have a blessed week. Jesus has your back. That’s very true. Sometimes the needless hate makes me so angry!